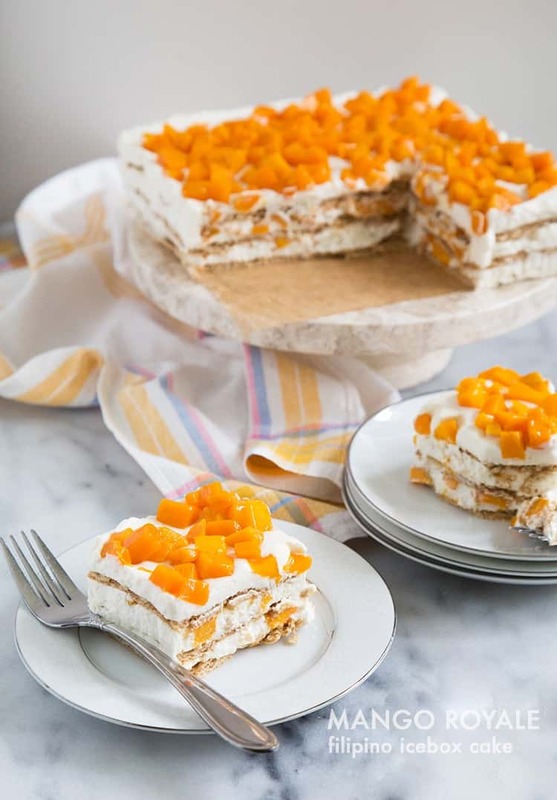 Mango Royale Icebox Cake is variation on a popular Filipino dessert called Crema de Fruta. 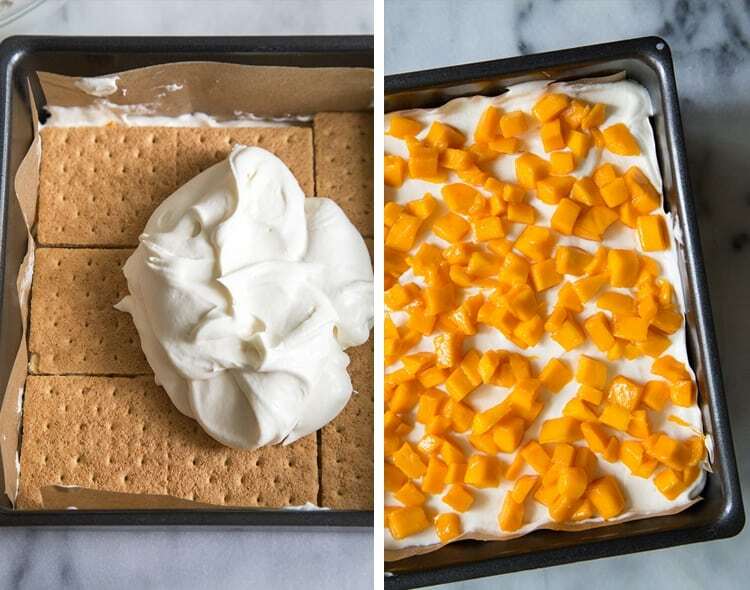 This quick and easy dessert is simply made with graham crackers, whipped cream, and fresh mangoes. This is one of my favorite no-bake desserts. It only requires 4 ingredients. (YES, ONLY 4 INGREDIENTS!) I present you with a slice of Mango Royale. This is a variation on a popular Filipino dessert called Crema de Fruta. What is crema de fruita? 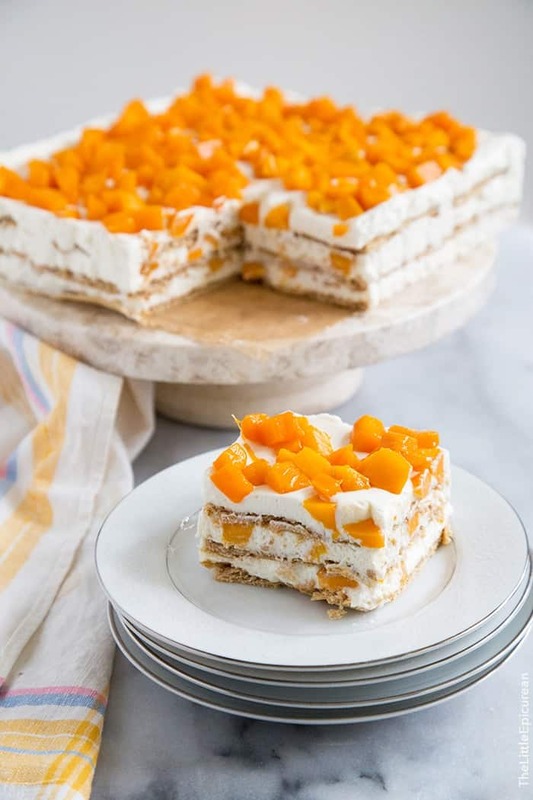 Traditionally, crema de fruta (which literally translates to” fruit cream”) is an icebox cake made of brojas (the Philippines’ version of ladyfingers), whipped cream sweetened with condensed milk, and fruit cocktail. It may not be the lightest dessert, but it sure is amazing. Growing up, crema de fruta was reserved for special occasions like birthdays and holidays because it’s so rich and sweet. From crema de fruta stems many variations. The most popular being the mango royale, also called mango float because of the abundance of mangoes in the Philippines. Like I said, you only need four ingredients to make this fabulous summer dessert: graham crackers, heavy cream, sweetened condensed milk and super ripe champagne/Manila/Mexican mangos. Champagne mangos are also known as Ataulfo, yellow or baby mango. Some markets also label them as Manila/Philippine or Mexican mangos. They are an oblong-shaped golden yellow mango with very thin skin. They taste a bit sweeter than most mangos and the fruit isn’t as fibrous. You are sure to find it at Asian or Latin markets (often sold in large boxes) and during the summer months, you can even get it at Costco. However, if you can’t find then, don’t fret. You can use any other variety. Just make sure it’s super ripe and sweet. Top graham crackers with a layer of whipped cream sweetened with condensed milk. Evenly distribute diced mango over the whipped cream. Repeat until you have three layers of cracker/cream/mango. Then you have a really big decision to make. You can either put the mango royale in the fridge OR you can pop it in the freezer. (Tough decision, right?!) Chill the dessert in the fridge for at least 4 hours, but overnight is best. During this time, the whipped cream will soften the graham cracker until it mimics the texture of a very thin layer of sponge cake. The whipped cream will firm up a bit and turn into a rich, luscious frosting. If you choose the latter option, you’ll end up with something like an ice cream cake. The cream will still soften the graham cracker, but the cream will also freeze like a semi-freddo. Either way, fridge or freezer, you will end up with a fantastic, decadent, fun, and easy summer dessert. If you can’t make up your mind about how to chill this mango royale, you can follow my lead. I chilled it in the fridge overnight. The following day (meaning breakfast), Alex and I ate half of it. I froze the remaining half and took it to my parents’ house. Naturally, they both freaked out when I presented it to them. Line a 9-inch square baking pan (with a removable bottom is best) with parchment paper along the bottom and sides to allow for easy cake removal. Line the baking pan with a layer of graham crackers. Cut crackers as necessary to fit pan. In chilled bowl, use a handheld mixer to whip heavy cream to soft peaks. Continue to whip while slowing adding sweetened condensed milk. Whip to firm peaks. Add about 1 cup of sweetened whipped cream over graham crackers. Distribute about 1 cup of diced mango over whipped cream. 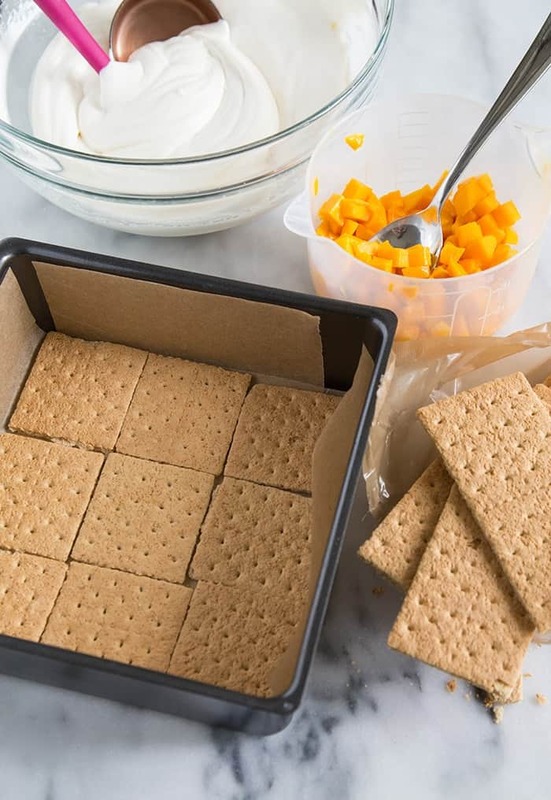 Place a layer of graham crackers over mangoes. Repeat twice by adding another layer of whipped cream followed by mangos. Cover pan with plastic wrap and let chill in the fridge for at least 4 hours, overnight is best. Alternatively, you can freeze the dessert for more of an ice cream cake kind of texture. Once chilled, lift mango royale out of the pan using the parchment paper overhang. Slice and serve. *Champagne mango, also known as ataulfo variety, honey, yellow or baby mango. Sometimes it's also called Mexican or Manila/Philippine mango. Those mangos are STUNNING. Oh man, you’ve got me wanting icebox cake like woah! Maryanne what an easy AND delish looking dessert! My son Sean got me hooked on mangoes so I will have to try this one! OH MANGO MANGO! I am in love with mangoes, especially the Philippine ones. 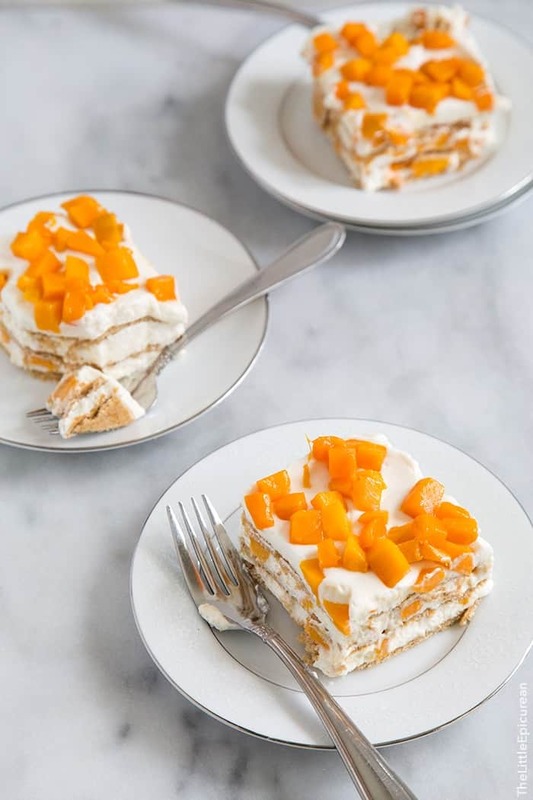 This icebox cake looks a lot like Macanese Sawdust Pudding, which also uses whipped cream and condensed milk. I can imagine the mangoes would totally make it better. Can’t wait to try!!! Sharing now. Thank you so much for the recipe! My lola used to make it all the time for us growing up! Can you give me some sample brand of heavy cream please…. OMG I cant wait to try this recipe! Mangoes are one my favorites! Ooo, this is perfect for summer, and mango is so in season right now. By the way, I love mango, and I am sure mango is the de facto fruit for this, but can we use other fruit? Sliced strawberries are a great substitute! Hi Maryanne, thanks for the awesome recipe. I’m living in Manila and really enjoy this sweet dish. I’m thinking about adding coconut cream to the whipping cream also, do you think it will work? You could add a small amount of solid (chilled) coconut cream to the whipping cream. I suggest simply adding coconut extract if you want coconut flavor. Hi Maryanne, thanks for the awesome recipe. I’m living in Manila and really enjoy this sweet dish. It’s funny cause I see the tray having lined 9 graham crackers per layer. 9 times 3 = 27 Graham crackers not 15 ! Probably you’ll need more filling too for 3 layers! That’s just a little observation but I forgot in my comment to thank you for the recipe!